"Money makes the world go round!" Check out these mind-blowing, shockingly true, and fun facts about money. From 1940 to 1946, the average income in America doubled. During 1940, the average worker was paid less than $600 a year. In 1946 the same worker got $1,200 a year. In 1919 the average income in America was around $650 per year. In the 1920s you could buy a brand new car for less than $300. In 1931 a new Chevrolet cost $623. Between 1968 and 1978 the price of new cars went up drastically. Cars cost twice as much in 1978 as they did in 1968. Shopping was fun in 1900. Women could buy a pair of shoes for just $1! Before the days of paper money, Americans traded animal skins, including deer and elk bucks, for goods and services. Hence the word "buck" to describe money. American Indians used to carry around strings of clamshells to use as money, which they called wampum. Wampum was the most common form of money in North America. By 1637, the Massachusetts Bay Colony declared wampum legal tender, which meant it could be used as money. What happens if your money gets trashed? The Office of Currency Standards will replace it if you can present to officials 51 percent of the note. If your cash has been burned, torn or otherwise destroyed, they will help you verify and replace that money. The office once received a shotgun in which a man had hidden some money, but forgot and fired the gun. In another case, a farmer sent his cow’s stomach stuffed with money. In 1916, you could get your money laundered for free! If your money was in good enough shape, you could take it to Washington, D.C., where it could be washed, ironed and reissued. Parker Brothers printed more money for its Monopoly games than the Federal Reserve has issued in real money for the United States. If you stacked up all the Monopoly sets made, the pile would be more than 1,100 miles high. If you had 10 billion $1 notes and spent one every second of every day, it would require 317 years for you to go broke. There is about $823 in circulation for each person in America. A piece of currency can be folded forward and back 4,000 times before it will tear. The $100 note has been the largest denomination of currency in circulation since 1969. The largest bill ever printed was the $100,000 bill; it was actually a Gold Certificate issued in 1934. These notes were used for transactions between Federal Reserve banks and were not circulated among the general public. President Woodrow Wilson was depicted on the bill. Cattle are probably the oldest of all forms of money. Cattle as money dates back to 9000 B.C. Some cattle were still used as money in parts of Africa in the middle of the 20th century. The first coins, pieces of bronze shaped like cattle, appeared around 2000 B.C. Their value was determined by their weight, making their use cumbersome. Coins with their value imprinted on them were first produced in Lydia (present day Turkey) around 650 B.C. Around A.D. 806, the Chinese invented and briefly used paper currency, but the first consistent use of paper money was by the French in the 18th century. The Massachusetts Bay Colony issued the first paper money in America in 1690. The colonies would later form the United States. On April 2, 1792, Congress created the U. S. Mint. A month later, land was purchased for its construction in Philadelphia, which was then the nation’s capital. The U.S. Mint produced its first circulating coins — 11,178 copper cents — in March 1793. Soon after, the mint began issuing gold and silver coins. 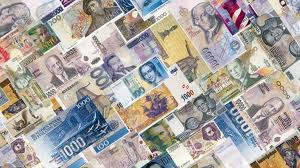 Currency is made of 25 percent linen and 75 percent cotton paper. Red and blue synthetic fibers of various lengths are distributed evenly throughout the paper. Prior to World War I, the fibers were made of silk. During fiscal year 1999, it cost the Bureau of Printing and Engraving approximately 4.2 cents per note to produce $11.3 billion U.S. paper currency notes. Ninety-five percent of the notes printed each year are used to replace those already in circulation. Forty-five percent of the notes printed are $1 bills. In 2002, the U.S. Mint produced 14,413,236,610 coins for general circulation. The United States Secret Service was originated in 1865 to combat counterfeit money. At the time, as much as one third of all the money in the United States was estimated to be counterfeit. Currently, about $250,000 in counterfeit money appears each day. One of the ways the Federal Reserve detects counterfeit bills is to check the iron content of the ink.